The STEAM Centre will improve STEM learning for teachers, parents and young people. As tomorrow’s thinkers, innovators and leaders, young people across Australia will be the focus of the Museum of Applied Arts and Sciences’ (MAAS) new Centre for Science, Technology, Engineering, Art and Mathematics (STEAM). The Centre for STEAM sees MAAS collaborate with a range of corporate and education partners, including Microsoft and Western Sydney University, to deliver a range of STEAM based initiatives that improve the accessibility, quality and creativity of learning opportunities for teachers, parents and the young people themselves. 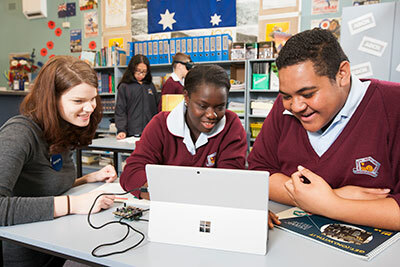 In its first year of operation, the Centre for STEAM will partner with the Australian Business and Community Network (ABCN) and Microsoft to launch Full STEAM Ahead, a program designed to give over 1000 under-represented Year 8 students across Australia the STEAM skills they need to create change in the world. MAAS-developed ThinkerShield classroom coding kits will be distributed to schools and students to support the Western Sydney Coding Club. Digital media workshops will be hosted in partnership with the Information + Cultural Exchange in Parramatta, and an annual program of video conferences will give schools across the country access to leaders across the STEAM disciplines. Upgraded STEAM-focused experiences will also open at the Powerhouse Museum in Ultimo, including a hands-on digital learning space, [[i]]The Lab, and interactive science gallery, Experimentations. President of the MAAS Board of Trustees, Barney Glover said that with Australia’s mathematical literacy falling against other OECD countries, and our scientific literacy not seeing improvement, there has never been a more crucial time to focus on fostering passion for STEAM disciplines in our young people. MAAS Director, Dolla Merrillees, explained that today’s classroom is not contained within four walls. Microsoft Australia Public Sector Director, Michael Gration said the strength of Australia’s economy relies heavily on the digital know-how of our future workforce. Find out more about the new Centre for STEAM that launched on Monday 28 November.